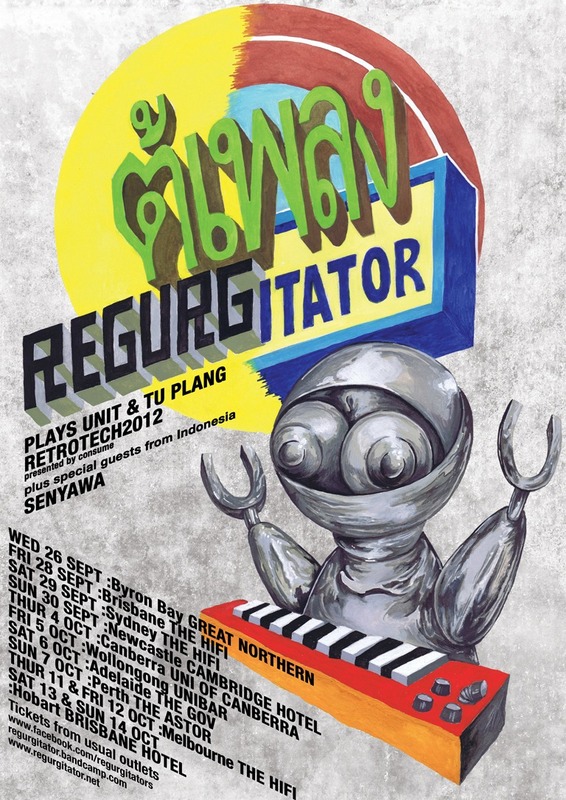 REGURGITATOR go retroteching 2012 ANNOUNCE 2nd MELB SHOW! LATEST NEWS!!! Interest in this tour has been pretty outstanding right across the country so far over this first week. So much so that the Melbourne HIFI has sold out as of today so we have decided to go ahead with a second Melbourne HIFI show on THUR 11 OCT. Tickets on sale as of now. In an era beset by an abcess of competition, an influenza of celebrity, a continental flux of technology… and the gasping breath of Regurgitator’s nineteenth year as the twilight of its teen years bears down on the double decades. Without looking back for the sake of cutting back… they take a knife to the face of nostalgia and sculpt it a new nose with the highly unexpected – playing TU PLANG and UNIT back to back. The thought has wafted around about this concept for a few smelly years now after outside forces prompted the idea with Quan. Discussed but never decided upon like all things regurgitated… just as it looked like a decision was ripe the Falls Festival off the still sweaty back of Public Enemy playing Fear of a Black Planet proposed that the guys do a similar thing with Unit at the end of 2011. After debating the merits of this a decision kind of made itself to tackle the idea in that format. The response was much better than anticipated and in the process the album found itself lodged in the upper branches of the Triple J Top 100 album thing. The third performance at Southbound in Busselton was particularly good, with Hugh delivering, as one overly excited punter described it, an incredible “feels like my head is trapped inside the stereo” live mix… whatever his craze it left everyone with a positive frame of mind about doing an eventual tour albeit when another decision could be reached that is. So after further speculative discussion… and with Tu Plang twisted in arm the time for a retrotech makeover of these seminal albums is now upon us. Along for the glide will also be Indonesian two-piece phenomenon SENYAWA… having performed at Melbourne Jazz festival, MoNA FoMA and Adelaide Festivals, Rully and Wukir return with their homemade bamboo instrument and perform “their traditional Javanese heritage filtered through a framework of contemporary experimental music practices” as special invited guests of Regurgitator. Continually unaware of guidebooks or the like… its just funtimes traffic as usual.